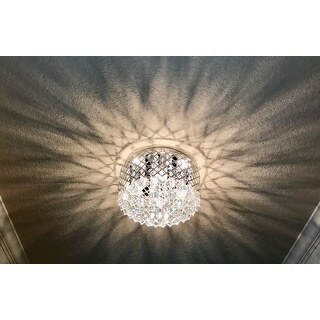 This chandelier has that BLING factor for sure! 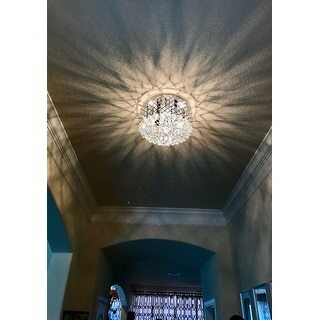 Placed it in my hallway and it is so beautiful and glitzy! The light it reflects is gorgeous!! Think I'm going to purchase one for my bathroom as well. Took me 45 mins to put together once I figured out the sequence of things. Some helpful hints: to put strand together open up one of the small circles to thread through the crystal, keep circle open and take a strand of crystal (start to put in the longest one (4) which are to go through the innermost part of light) close circle then take one of the "straight pins", thread through the top of strand and hook up through top of light.. Start with 4's then 3's then lastly 2's it will be easies that way. It hangs beautifully and does not look cheap at all, crystals r very heavy. I was def concerned with that considering price was so good! Watch out--it's bigger than it looks!!! 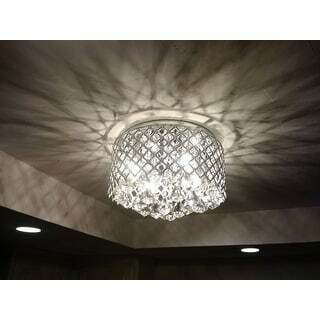 I intended to replace 3 builders grade flush mount lights with 3 of these fixtures. The builders grade lights were probably 8 inches in diameter, so I guess I just assumed these would be the same. Nope! These are about 12-14 inches wide. They are huge! I have all 3 in a row in a hallway right next to my living room/dining room combo. 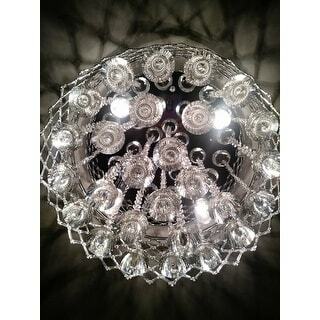 I also installed a new chandelier in my dining room, and the 3 of these complete out shine the 1 chandelier! They are the same size, and they sparkle waaaaaay more. I love my bling, but I'm still getting used to the bling on these fixtures. Holy cow! They are sparkly! I love them, but now feel like my chandelier is completely inadequate. LOL. The lights are beautiful, just be prepared for sparkle and being large. Other than that, no complaints. 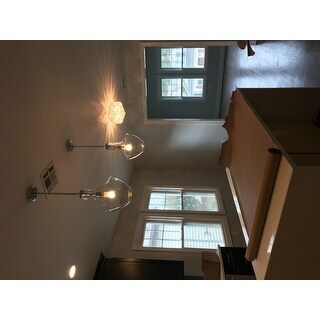 Nice chandelier, my only complaint is that there weren't ANY measurements on overstock. I had to go to another website to see what they were and when I got the chandelier, it wasn't the same size. It is very small, about 13.5 inches wide. We kept it because it does look nice once up and lighted. The outside chrome part at first looks very cheap when we opened the package but then it comes together nicely. Also, the bulbs are confusing on the "directions", but we figured out that all you need are basic candelabra bulbs that screw in. I echo everything that had been said here. 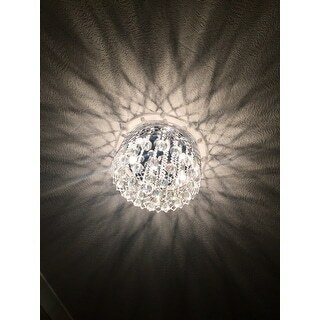 The chandelier looks great and better quality than expected. I think four 40watt bulbs is a bit too bright but I guess it depends on what size your room is. I downgraded to four 25 watt bulbs and it is perfect for my space. I love it and would highly recommend it. For my living room, I've been searching for something that's not run of the mill (like those you find in the large home improvement stores) but also reasonably priced. I read so many of the reviews on this light and decided to go for it. So glad I did! Someone installed the light for me; I wasnt around to watch so I can't comment on the degree of difficulty there. Bulbs do not come with the light which isn't tragic. Approximately $4 for 4 40-watt candelabra bulbs. I chose the clear bulb. 40 watts is definitely sufficient, I am 100% satisfied but I can understand why another reviewer went with the 60 watt.....those bulbs probably make this light fixture shine even brighter. It's incredibly sparkly, looks pricier than it is, it's just beautiful. It throws off a pretty reflection on the wall and ceiling. I would recommend a dimmer switch. Don't read any more reviews, buy it! .....and while you're waiting for it to be shipped to you, go get those bulbs so you're ready when it does arrive! First let me say it's a beautiful chandelier. We bought 2 - one for the foyer and one for the hallway. Some reviewers said it took a long time to assemble the crystals. I can't speak for the mounting of the light fixture, because my boyfriend installed it, but he had no complaints at all about it. As far as the crystals go, you must be patient! Don't start this project and expect to finish in 20 minutes. It will take about 40 minutes if you have a plan. Unwrap all the crystals and set them out. The crystals on the outer portion of the chandelier have 5 beads, the next inner crystals have 6 beads and the center 4 crystals have 7 beads. Standing on your ladder, start threading the outer crystals furthest away from you and work half way toward you, threading the center ones as well. Turn your ladder around and do the other side. Make sure to hang onto the large crystal on the bottom with one hand and slide the wire through the little hole with the other. You don't want to let go of the large crystal until it is inserted properly. It is like threading a sewing needle, but just be patient! You will be happy with the final product. Hope this helps some people out. 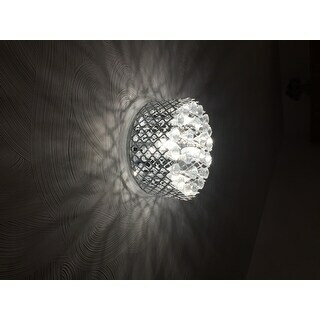 I was hesitant to purchase this light because I thought the crystal might look cheap and bulky. But after installation and hanging each crystal strand on the plate which took a while, we turned on the light and there was so much sparkles reflected the wall and ceiling. It was really bright and stand out on the ceiling. We put this light in the hallway and it was perfect. The electrician really loved it too. The crystal was heavy and NOT cheap looking. It was like Australian crystals. You have to buy the light bulbs. That's the only thing I wish it was included. Crystal lights are known to be super expensive if they're real crystals. 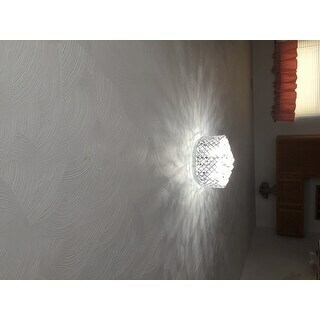 BUT this light is a fraction of the cost and still give you that expensive crystal look for such a low price. So go for it and it won't disappoint you! 4 stars because I wish it came w/light bulbs. As others have said this seems like a cheap fixture until assembled and hung. The look is top notch. A few more assembly suggestions as follows: I used a tooth pick to spread the o-ring (similar to how you woul add a key to a key ring) and then used pliers to attach the o-ring to the fixture. Attach the crystals from the outside to the inside. We set the fixture upright on a piece of cardboard to hold while the wires were connected. This fixture does take two people to install because of the weight of the crystals. While it was suggested to hang the crystals after the fixture is installed I think it would be much more difficult to do that. I have bad eyesight and it took all of my patience to add the crystals but is 100% worth taking your time to get the look. I hung this in my upstairs hall with 25 watt bulbs which is more than enough light and if I find 10 watt bulbs I am going to use instead. As others have mentioned they are going to install a dimmer switch which is a great idea. Well worth the effort. I needed a flush mount chandelier. I can not believe how amazing this fixture looks. It added just the right amount of sparkle to the room. Looks very high end. There is nothing I don’t like about it. Another good quality i bought from overstock and easy to install. Putting the crystals must be done after mounting the base and it's easy because they used a hook not a ring. I bought this one and the matching semi-flush. My taste is more traditional but the reviews and price twisted my arm. Well they are so beautiful that I am returning the traditional crystal chandelier I also ordered, as to not be so matchy-matchy, for the hanging version of this as well. I can look at them all day. Gorge! Just as described. It was annoying to have to assemble the chandelier, but with some patience, it wasn't all too bad! it took about an hour to assemble and 30 minutes to install. 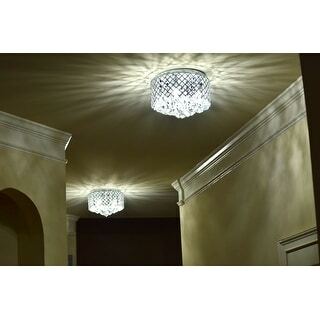 Used a Dimmer for this light, adds a glamorous feel to any space! 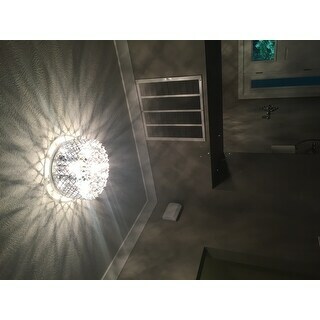 received in timely manner, well packed, easy to mount, and chandelier are easy to hang and when i turn on the light it is a beautiful ceiling mount chandelier, i used dimmer for night so i see the sparkles.......JUST BEAUTIFUL and the price is unbeatable.....so i am getting 2 more and i got free shipping too. Sooooooo happy with this purchase to the point we may purchase another one for our room. I hired out for installation as we had a few lights that needed to be installed but I hung the jewels myself and it was very easy. So we have one hook missing that connects the jewel to the fixture, we are well out of our return policy-which I didn't plan on returning-but called anyways and they are sending a replacement hook! Stellar customer service!! Trust me I tried to rig something up at home but it just wasn't working! I had my handyman install this but it seemed easy enough for him. I LOVE LOVE LOVE this chandelier. Of course it isn't high quality crystal, but it's still very impressively gorgeous. There were quite a few pieces to assemble, but that's to be expected and it wasn't difficult or take very long. It was packaged very well; no damage and an extra hanging crystal was included. I have it on a dimmer switch and I cannot believe how gorgeous it is in person. I'm in the process of a kitchen renovation and just had my dropped ceiling taken out; replaced florescent lights with LED recessed cans and this chandelier. I have 'bling' kitchen cabinet handles and this looks great with them! We put this in our master bedroom in our cottage. This really dressed up the room. It is gorgeous, and so worth the monet. 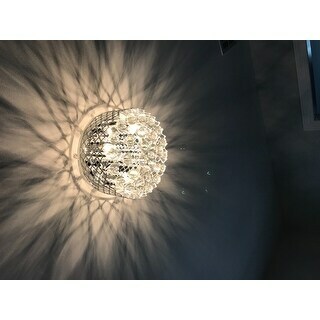 I would tell anyone to buy this chandelier!! 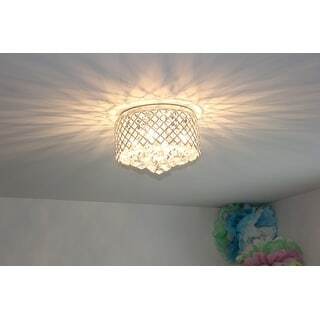 I bought this to replace a one bulb light in my kitchen. It is very pretty and gives off lots of light. The crystals make a lovely pattern on the ceiling. My son put it up without much trouble. It was a little confusing how to hang the crystals; but he figured it out. I would definitely recommend it to a friend. Beautiful. Looks much more expensive. Very good lighting. If I had to, I would purchase this item again it is so classy looking, to keep you proud of your purchase, you should keep it glistening and looking like it's being cared for. 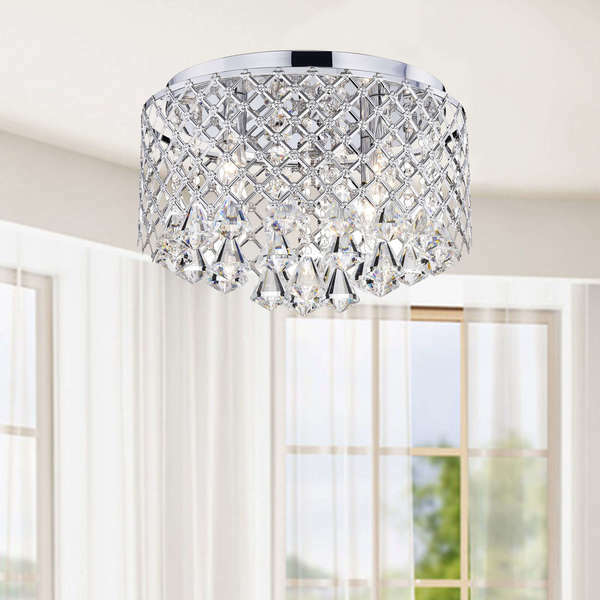 The Nerisa Chrome Crystal Chandelier is absolutely beautiful and stunning! We put this in our laundry room! It leaves a lacelike print on the wall! Great value for the price!! "Can someone tell me how to install the crystals (ie. which size to which string)? The instructions are not in my box. Thank you." Please open the clip at the top end of the crystal strand to attach it to the hook on the metal plate. "Is this fixture rated to be used in a bathroom?" No, it can not be used in a bathroom. The metal is made of iron, which will be easily rusted in damp location. 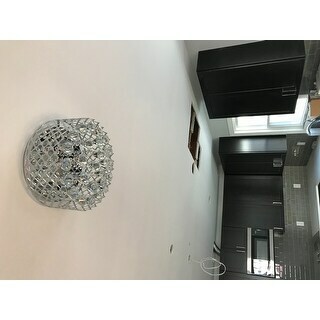 "Is this light appropriate for a kitchen? I would need two." Yes, I bought one for my daughter and my mother, both for their kitchens. Very glamorous and gives off a good amount of light. 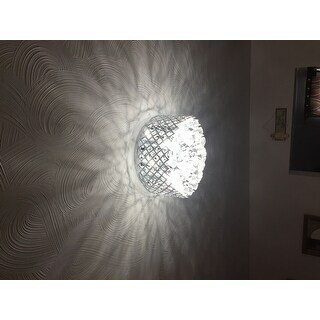 If you like the glam look and like a little bling, this chandlier is for you!! Can't go wrong. Yes, this light is appropriate for a kitchen. I have mine over the sink in my kitchen and love it. "How much does this light weigh?" Its net weight is 7lbs and gross weight is 9lbs. 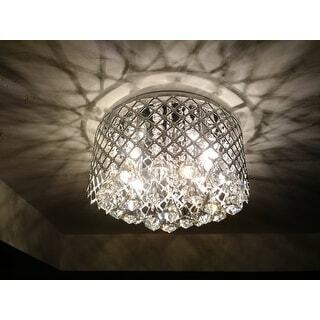 "I have this chandelier in my dining room it is simply stunning! I want to purchase another for my hall entrance, can this be installed as a hand pull switch turn on?" Yes, this light can be installed as a hand pull switch turn on. I am not sure as I had my electrician install this light fixture. "You have answered 2 questions regarding bathrooms that are opposite of each other. 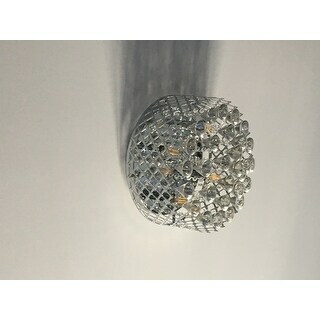 I want to order this or one simular.but want to know for certain if it can be used in a bathroom or please give me the info of a similar one thst can "
I'm not sure if this light can go in the bathroom or not. I actually put it in the are right before my bathroom between our bedroom and bathroom. We have a small are between our closets that lead to the bathroom and it was perfect there. This light is really beautiful on and off. This is not a question I answered before, but since I got the message to respond, I'll chime in. It is fancy, but it seems that it would be fine in a bathroom. As long as the room is vented to prevent any damage from humidity. There are many who have responded who seem to think it works just fine there. "Would you tell me, please, what is the safety certification for this light? Is it UL, CUL, CSA? All three? Is it dimmable?" It's cUL listed. It's dimmable by installing a dimmer switch.